Coconut milk is obtained from grated coconut kernel. It is a very popular ingredient in South East Asian cuisine. The rich taste of coconut milk is due to the high oil content. It can be consumed raw or used as a substitute to milk in the preparation of various dishes. In some countries, it is also used to make a type of summer drink or added to cocktails. Coconut milk is also preserved and sold commercially in a tetra pack. While adding coconut milk to curries you can avoid curdling of the milk with these tips. After adding the coconut milk keep the heat low and do not let it boil. Keep stirring frequently while adding the coconut milk and also while it cooks for a couple of minutes. Let it simmer uncovered. If this doesn’t work mix a teaspoon corn flour to the milk and then add it. It is packed with vitamins C, E, B1, B3, B5, and B6 as well as iron, selenium, sodium, calcium, magnesium and phosphorus. It contains high levels of saturated fats therefore its consumption is advised with care. Coconut milk also has medium chain fatty acids that may help promote weight maintenance without raising cholesterol levels. Coconut milk contains lauric acid, also found in mother’s milk that is known to promote brain development and bone health. 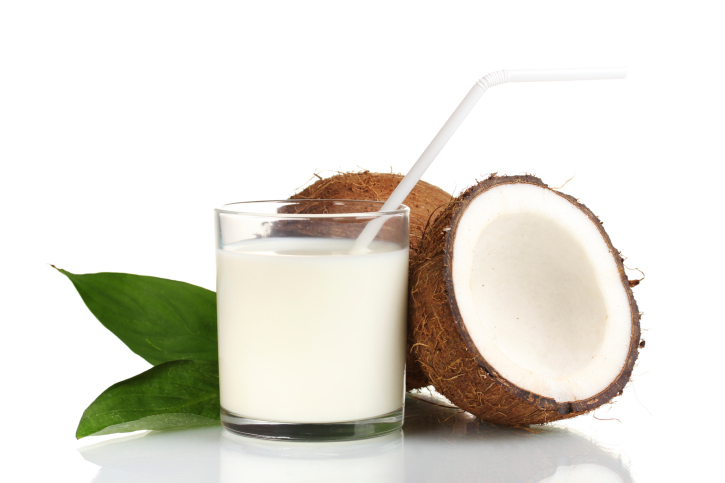 Coconut milk is a great source of Vitamin E that helps in the nourishment of the skin.